ISO image file is a very useful file format, considering an ISO image as a complete copy of everything stored on a physical optical disc like CD, DVD, or Blu-ray disc—including the file system itself. If you are not quite familiar what an ISO file is, T=try to picture it like a box that holds all the parts to something that needs built—like LEGO that requires assembly. They are a sector-by-sector copy of the disc, and no compression is used. Which is to say the toy box with all toy pieces literally does you no good as an actual toy. Instead, the contents inside of it make the whole value. Once taken out and put together then it will become what you actually want to take advantage of. The wonderful thought behind ISO images is that you can always archive an exact digital copy of a disc, and then later use that image to burn a new disc. In turn, an exact copy of the original will be generated. So, converting your AVI file to an ISO image file is like converting it to a digital version of a DVD or Blu-ray. Today I will show you how to convert AVI to ISO image file in the easiest way. In order to convert AVI to ISO file, you need a good DVD creator program to help you. A DVD creator is the software that can burn your digital file to a disc or convert to an ISO image. Not all DVD burning programs can generate ISO image files. Most of the DVD creator programs can only burn an optical disc. There is one DVD burning program that I want to introduce to you today, it can directly burn a nice DVD from an AVI or any other digital video file, as well as convert the video file to an ISO image file. The program that I am talking about is Leawo DVD Creator. Leawo DVD Creator is a professional DVD burning program that can easily burn all kinds of videos to a DVD disc. It supports more than 180 video formats for DVD disc or ISO image conversion including AVI. The advanced burning technology within the software can allow you burn your video in a highest speed and preserve the original quality at the same time. The program is easy to use, and can deliver a stable performance when burning any video to a DVD disc or ISO files or folder. To convert an AVI video file to ISO image, all you need to do is to follow the instructions below. Step 2: Import your source AVI video by clicking the “Add Video” button. You can also import the AVI video by dragging and dropping the AVI file into the main interface of the program. Step 3 (Optional):Leawo DVD Creator provides some additional functions for you to burn a more personalized DVD disc. If you want to do some further edits to your video, click the edit button on the video, you can trim, crop, add special effects, add watermarks, or turn 2D video to 3D in the built-in video editor. You can also create a DVD menu base on the beautiful DVD menu templates. To create a menu for the ISO image, simply choose a menu template form the right side bar and edit it as you like. There are online templates and built-in ones so you will have a lot of options for your menu. Step 4: Finally, click the green “Burn” button to call out the burning setting panel, where you can set output format, whether you want to create an ISO file or folder, or you want to burn your video to an optical DVD disc. To burn to an ISO image file, make sure you check the box "ISO file" only and leave other boxes empty. Then set an output directory. When you have set all of that, click the burn icon below to start burning. You can choose to shut down your PC when it’s finished if you don’t want to wait. Now that you have successfully converted your AVI video to an ISO image file, the next thing you might want to do is to burn it to a DVD disc. Although you can directly burn the AVI file to a DVD disc with Leawo DVD Creator by selecting an optical disc as output format when converting it to an ISO, I can still introduce some other way to burn your ISO to a DVD, in case you need to deal ISO image files more often. There is more than one way to burn the ISO file to a DVD. 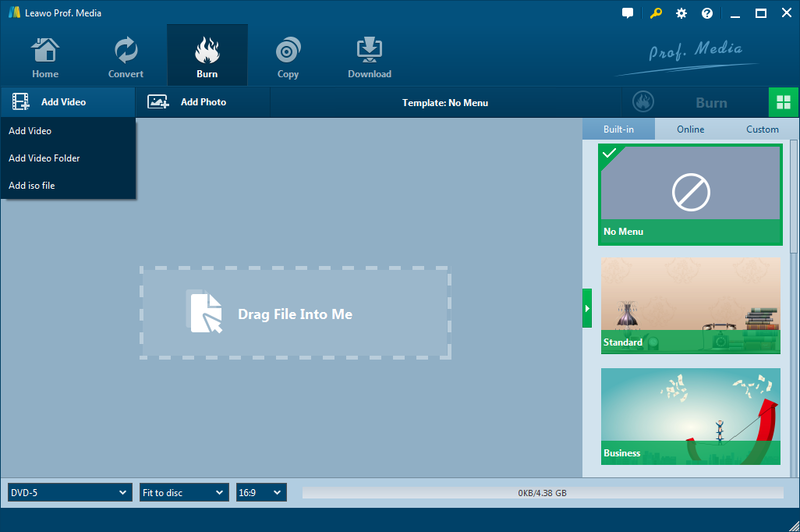 The first way is still using Leawo DVD Creator. Instead input a video file as the last part suggests, simply input an ISO file would allow you to burn it to a DVD disc. The other way is to burn the ISO image file with Leawo DVD Copy. Using this could allow you make a 100% copy of your ISO image file. Now I’ll introduce both of the solutions to you. Step 1: Import the ISO file Just like when you are burning a video, instead importing a video file, click “Add Video” button, and then click “Add ISO File” button on the following menu, select the ISO image file on your computer to be imported to the DVD Creator. Step 2: Burn the ISO file After you import the ISO file to the burner, make sure that you have a blank disc in your CD-ROM. A pop-up window would now show up, allowing you to choose the CD-ROM you put the blank disc in as the target on the Copy to box. You can also rename the disc label. And then click Burn button to start burning the ISO image file to the blank disc, just like when you are converting the AVI to ISO image file, except this time you burn the ISO file to the blank disc. Leawo DVD Copy is a professional DVD copy and backup program that can make backups for DVD optical disc, as well as DVD image files. It can make disc to disc copy as well as ISO to disc copy which is the feature we are going to use today. Being different from Leawo DVD Creator, in which you can do adjusts to your video, in DVD Copy you can make perfect 1:1 copy of your DVD. The optput file is 100% identical with the original file. Step 1. Import ISO File. 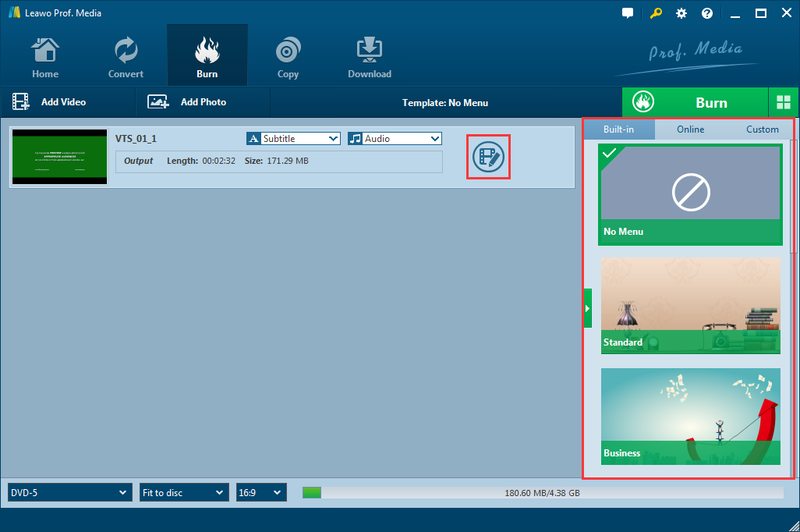 As it is in Leawo DVD Creator, click “Add Blu-ray/DVD” button and then “Add ISO file” to import ISO file or directly drag and drop the file into the program. Step 2. ISO copy settings. After loading, choose Disc type, Copy mode, Subtitle and Audio Tracks. You can choose the copy mode from “Main Movie”, “Full Movie” and “Customized mode”. Disc size for output files is also shown below. Then, you can click the big green “Copy” button to do more backup settings: “Copy to”, “Disc Label”, and “Save to”. Step 3. Start backup. Finally, click the “Copy” button on the sidebar to start converting ISO file to DVD. 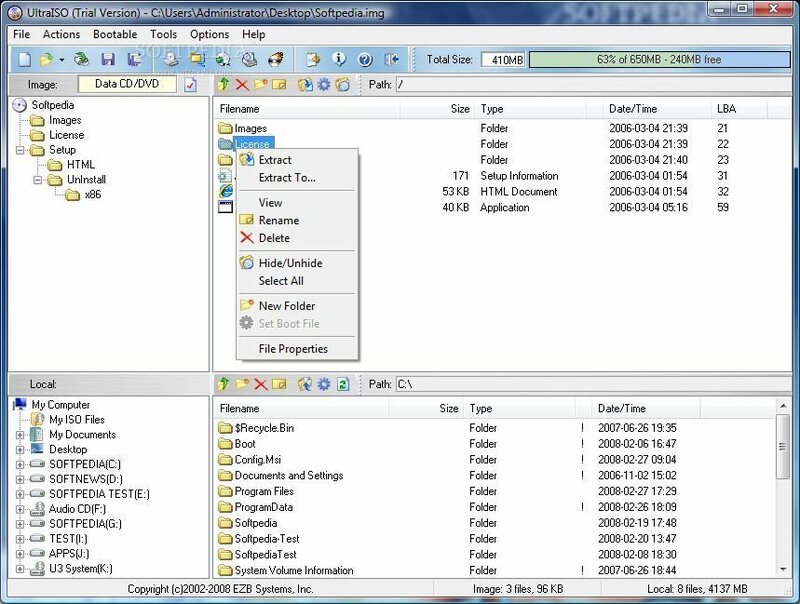 PowerISO is a virtual drive that allows users to encode, burn, mount, and even encrypt CDs, DVDs, and BDs. The software can be downloaded from many platforms and sites online. As a powerful CD / DVD / BD image file processing tool, PowerISO allows you to open, extract, burn, create, edit, compress, encrypt, split and convert ISO files, and mount ISO files with internal virtual drive. It can process almost all CD / DVD / BD image files including ISO and BIN files. PowerISO provides an all-in-one solution. You can do everything with your ISO files and disc image files. The program is compatible with both 32-bit and 64-bit operating systems. It offers a wide range of features that span over different categories, and it’s available for Windows, Linux, and Mac. Whether you’re looking to convert a CD or DVD image file to another format, or you want to make a bootable CD from scratch, this program has the tools you need. It supports conversion to ISO, BIN/CUE, Alcohol, Nero, Xbox, and more, and you can also edit ISO files directly through the main interface. UltraISO is capable of emulating ISO images as well, with the option of using up to eight virtual drives. With this level of functionality, you should have no problem completing just about any task you have on tap. However, the interface of this app is pretty plain and technical-looking, which could make it a bit intimidating to newer users. Experienced users won’t have much trouble finding what they’re looking for, but even new users can learn their way around quickly, as long as they’re not put off by the technical-looking initial presentation. Gizmo Drive is excellent emulation software which allows you to mount a disk image in ISO or other formats to a virtual drive using its driver. When an image is mounted, it appears as an actual CD/DVD-ROM drive or hard drive in Windows Explorer. It supports up to 26 virtual drives. Other types of images which can be mounted include VHD, IMG, BIN, CUE, NRG, CCD, MDS, MDF and GDRIVE. 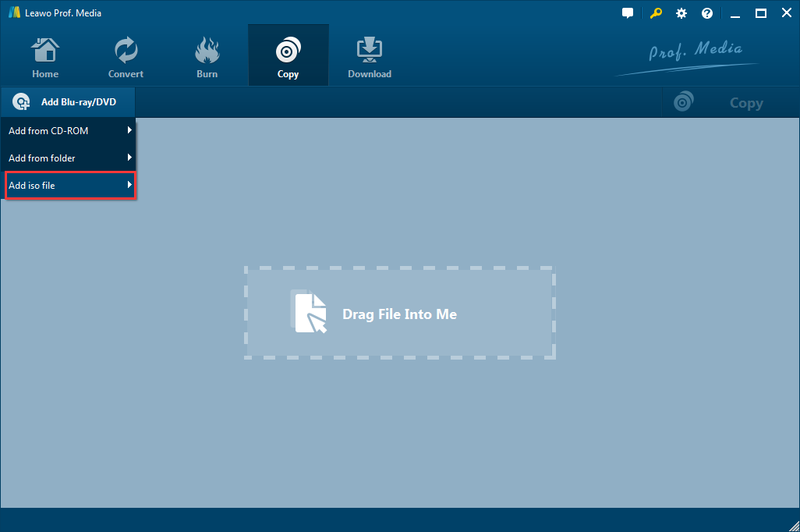 In addition to mounting images to virtual drives, Gizmo Drive allows you to create ISO images from a disk or folder and burn the contents of an ISO file or a folder to a recordable disk. 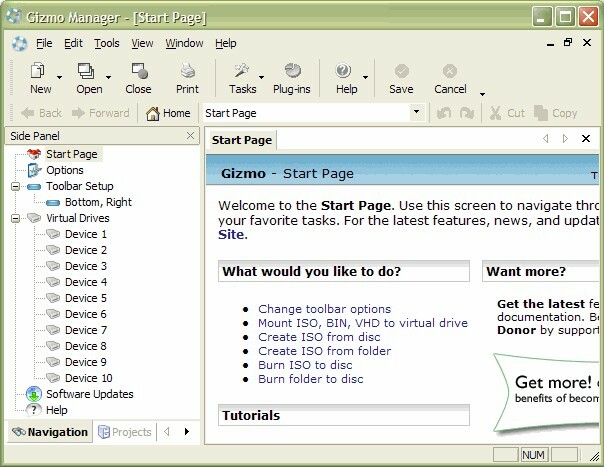 It comes with a Gizmo Manager and Image Wizard to perform the various tasks.